Petmate's Two Door Top Load kennel keeps pets comfortable and secure, giving pet parents peace of mind. 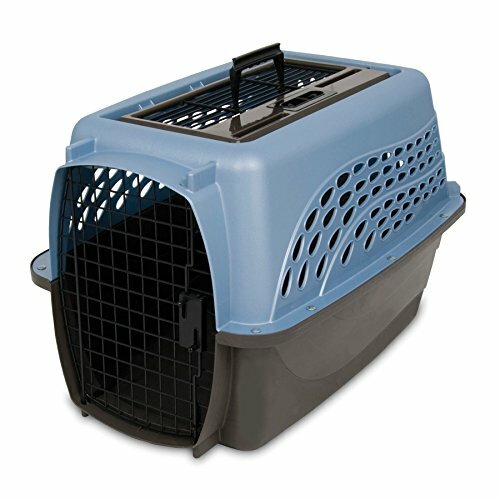 The Petmate Two Door Top Load kennel features a unique top-loading door that allows pet parents to easily place and remove pets from the carrier with both hands. Sturdy enough for travel, both front and top-load doors are constructed with steel, and feature easy-squeeze latches for convenient access. For use as a pet travel carrier or dog kennel, pets will enjoy visibility on all sides of the kennel and the flow of fresh air. As a kennel for small dogs and puppies, the sturdy plastic walls and steel doors keep pets protected, and the spacious kennel bottom can accommodate a kennel pad for added cushion. The kennel measures 24 inches long for a range of small pets; pet parents can choose from four pearlescent color combinations: "Pearl Honey Rose/Coffee Grounds"; "Pearl White/Coffee Grounds"; "Metallic Pearl Ash Blue/Coffee Grounds"; "Metallic Pearl Tan/Coffee Grounds"